I'm making slow progress on the third edition edits for Go Play In Space for the Orbiter 2010 space flight simulator. I sometimes need to present various aspects of "rocket science" in the course of explaining the intricacies of maneuvering in space (otherwise known as orbital mechanics) in Orbiter. This has led me to look into how other authors handle these explanations, so I've revisited a favorite book and have bought a new one. My perspective is a bit more practical than for many general readers - I am trying to teach my readers how to operate realistically simulated spacecraft, so when they encounter things like ascending nodes, they want to know what they can do with them (like align the plane of their current orbit with that of the ISS in preparation for rendezvous and docking), whereas other readers might just say, "that's nice" and turn the page. 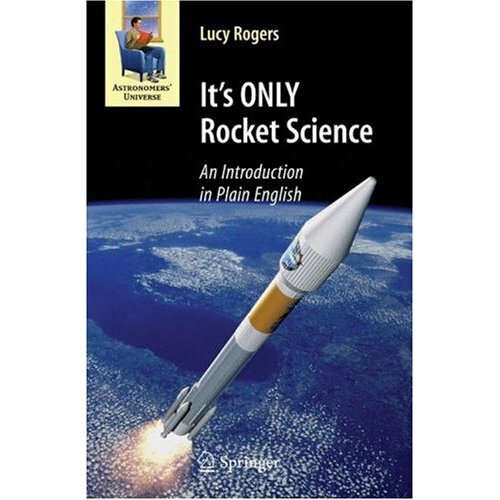 The new book is It's ONLY Rocket Science by Lucy Rogers (I bought the Kindle version). 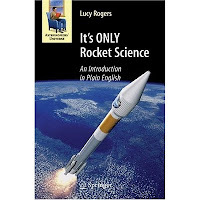 Dr. Rogers is a British mechanical engineer and freelance journalist on space and astronomy topics (perhaps among others).She says on her website that she aims to write about science in plain English, and she pretty much succeeds in this book. For example, her explanations of orbital elements, Lagrange points, and ground tracks are quite clear and include some simple illustrations (including ones for Molniya and geosynchronous orbits). On the other hand, her explanation of rendezvous and docking is rather too brief, and could use some more illustrations for someone who wants the background needed to actually do rendezvous and docking in a real spacecraft (or in Orbiter, for most of us). The book also covers the space environment, rockets and spacecraft, types of missions, propulsion systems, communications, humans in space, and other topics in addition to the basics of orbital mechanics. There's a website with information and book excerpts here. So if you are a budding astronaut (or Orbinaut), which book should you choose? Ideally you should read both - Rogers covers some topics better than Lee (for example, Lagrange points) and you may find some explanations to be clearer in spite of the small number of illustrations. But if you want to really understand how orbits work and how you change them to get where you want to get in space, you should grab a copy of Wayne Lee's book before the used copies run out. Rogers' 2008 book is still in print (paper and Kindle). In my not-so-copious spare time, I am working on the 2010 update to Go Play In Space, the tutorial and exploration guide e-book that I wrote for the free Orbiter space flight simulator (with help from Andy McSorley on the second edition in 2006, and now from Mark Paton on the 2010 edition). Orbiter has a 2010 edition described here, with enough new and changed features to justify a new edition of Go Play. 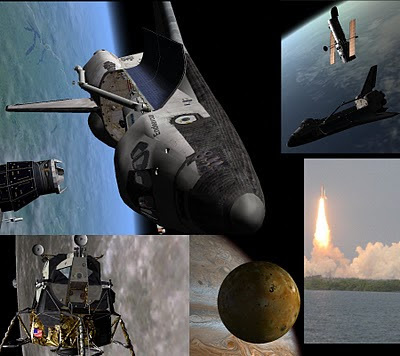 The new edition will add a chapter on re-entry (written by Mark), and the rendezvous and docking chapter will use the supplied shuttle Atlantis spacecraft rather than the more powerful (but fictional) Deltaglider spacecraft used in the second edition. It's more realistic in that it's based on a launch (using a launch autopilot written in Orbiter's new scripting language), rendezvous, and docking scenario that happens in real life, although sadly not for much longer. I'm glad to finally be adding some shuttle operations to Go Play In Space. Speaking of flying the shuttle in Orbiter, there's a brand-new edition out of the amazing Shuttle Fleet add-on for Orbiter 2010-P1 (Shuttle Fleet 4.7 by David413). I've only just downloaded and installed it, but it looks great. It includes support for local light sources which should improve the already impressive visuals. I will be discussing the Shuttle Fleet in the add-on chapter of the new Go Play In Space. The picture above is a nostalgic Shuttle Fleet screen shot of STS-1, the very first flight of the first operational shuttle, Columbia, April 12, 1981. Notice the white-painted external tank that was used on the early shuttle missions (they stopped painting the tanks on later flights to save weight, leaving the now familiar rusty orange color of the insulating foam). Everybody's Dummy is a cool music blog. A few times a week it posts a detailed review of a classic album. I've discovered or rediscovered some great music by artists such as Bob Dylan, the Rolling Stones, the Beatles, Elvis Costello, and Dire Straits. Mainstream artists to be sure, but I don't know everything they have ever done, and it's cool to find an overlooked gem, or just to read an insightful review of an old favorite. The title is from a quote by Lester Bangs, "I'm nobody's dummy. I'm everybody's dummy. I believe everything I read, see, and hear." Happy new year! I'm back to a crazy work schedule, but every once in a while I get obsessed with some strange little thing. Tonight it was a new feature of Blogger, the ability to define your own blog template background image. I had a perfectly good stock image of the Earth, but was that enough? Of course not! I decided I needed a collage of Orbiter images instead (plus one picture I took of the real STS-118 launch). They said to make it 1800 x 1600 to allow for full screen, and I tried a couple of variations before arriving at the one shown here and in the background. Some of the edges are OK (depending on how your window is sized), but you really can't tell in the background that the upper left image is a closeup of the shuttle. I also just discovered that the 1800x1600 doesn't really fill the screen when Safari scales the web page for the iPod Touch. Oh well, it will have to do for now.